It's a nice comparison though. Tunic looks like a game that's taken a lot of inspiration from SNES era Zelda titles — and when Xbox's E3 2018 showcase is an awful lot of games with guns, zombies or unexplained apocalyptic surroundings, it was a welcome panacea. Meet the tiny fox embarking on an adorable, mysterious adventure. 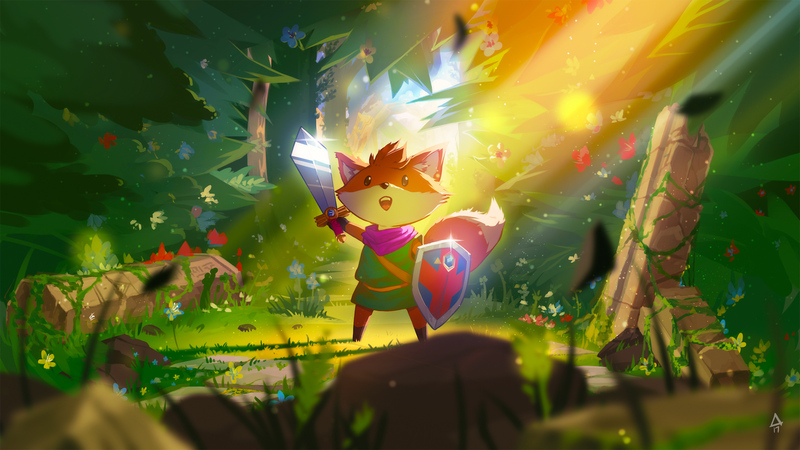 After Microsoft's 50-game press conference barrage, I took a closer (but hands-off) look at the isometric action game behind closed doors, and it looks as charming as you'd expect for a game featuring a cute sword-wielding fox as its protagonist. The team also outlined some cool meta features to it: In-game text is all pictographs and untranslated scripture, while treasure chest can sometimes contain (besides new weapons, potions and currency) game manual pages for, well, this very game. A lot of the fox's skills are apparently there for you to use right from the start, while others hinge on finding new weapons and items. Those game manual pages will give nods to intermediate and higher-level techniques you'll need later against tougher enemies. And they do get meaner than bouncing blobs and shady foot-soldiers. Independent developer Andrew Shouldice, who has paired with Finji, showed Engadget some of the bigger challenges to come, including a huge spider robot tank... thing that dwarfs your hero. I asked Shouldice what it was like to make a game in a genre that doesn't typically appear on Xbox consoles. He replied: "Great! I'm filling a cool niche!". And he's not wrong. Indie games are the major outlet for mellower game titles on Microsoft's console, and alongside Ori, this is shaping up to become a highly-polished addition to the Xbox's big new game push.